Also known as sounding sand, singing sand is sand that emits musical, humming, whistling, or crunching sounds when disturbed. Although it has been studied extensively, the phenomenon is not completely understood. When it occurs near dunes, the sound accompanies a slumping or avalanching movement of the sand, usually triggered by wind or by someone walking near the crest. Different patches of sand are even said to "sing" at different frequencies. Singing sand, whistling sand or barking sand is sand that produces sound. The sound emission may be caused by wind passing over dunes or by walking on the sand. There are various theories about the singing sand mechanism. It has been proposed that the sound frequency is controlled by the shear rate. Others have suggested that the frequency of vibration is related to the thickness of the dry surface layer of sand. The sound waves bounce back and forth between the surface of the dune and the surface of the moist layer creating a resonance that increases the sound's volume. The noise may be generated by friction between the grains or by the compression of air between them. Other sounds that can be emitted by sand have been described as "roaring" or "booming". The particular note produced by the dune, between 60 and 105 Hertz, is controlled by the rate of collision in the shear band separating the avalanche from the static part of the dune. For spontaneous avalanches, the frequency is controlled by gravity and by the size of the sand grains. Singing sand dunes, an example of the phenomenon of singing sand, produce a sound described as roaring, booming, squeaking, or the "Song of Dunes". This is a natural sound phenomenon of up to 105 decibels lasting as long as several minutes that occurs in about 35 desert locations around the world. The sound is similar to a loud, low-pitch, rumble, and it emanates from the crescent-shaped dunes, or barchans. The sound emission accompanies a slumping or avalanching movement of the sand, usually triggered by wind passing over the dune or by someone walking near the crest. Sand blowing off a crest in the Kelso Dunes of the Mojave Desert, California. 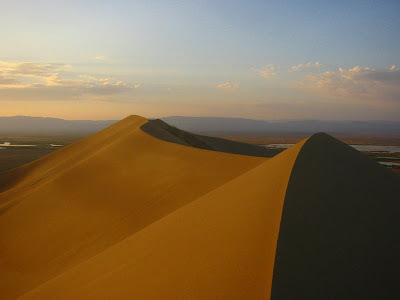 Examples of singing sand dunes include California's Kelso Dunes and Eureka Dunes, sugar sand beaches and Warren Dunes in southwestern Michigan, Sand Mountain in Nevada, the Booming Dunes in the Namib Desert, Africa, Porth Oer (also known as Whistling Sands) near Aberdaron in Wales, Indiana Dunes in Indiana, Barking Sands in Hawaiʻi, and Singing Beach in Manchester-by-the-Sea, Massachusetts. Also near the military base south west of Doha, in Qatar, and Gebel Naqous, near el-Tor, South Sinai, Egypt. On some beaches around the world, dry sand will make a singing, squeaking, whistling, or barking sound if a person scuffs or shuffles their feet with sufficient force. The phenomenon is not completely understood scientifically, but it has been found that quartz sand will do this if the grains are very well rounded and highly spherical. It is believed by some that the sand grains must be of similar size, so the sand must be well sorted by the actions of wind and waves, and that the grains should be close to spherical and have dust-, pollution-, and organic matter-free surfaces. The 'singing' sound is then believed to be produced by shear as each layer of sand grains slides over the layer beneath it. The similarity in size, the uniformity, and the cleanness mean that grains move up and down in unison over the layer of grains below them. Even small amounts of pollution on the sand grains reduces the friction enough to silence the sand. Others believe that the sound is produced by the friction of grain against grain that have been coated with dried salt, in a way that is analogous to the way that the resin on the bow produces sounds from a violin string. It has also been speculated that thin layers of gas trapped and released between the grains act as 'percussive cushions' capable of vibration, and so produce the tones heard. Not all sands sing, whistle or bark alike. The sounds heard have a wide frequency range that can be different for each patch of sand. Fine sands, where individual grains are barely visible to the naked eye, produce only a poor, weak sounding bark. Medium-sized grains can emit a range of sounds, from a faint squeak or a high-pitched sound, to the best and loudest barks when scuffed enthusiastically. Water also influences the effect. Wet sands are usually silent because the grains stick together instead of sliding past each other, but small amounts of water can actually raise the pitch of the sounds produced. The most common part of the beach on which to hear singing sand is the dry upper beach above the normal high tide line, but singing has been reported on the lower beach near the low tide line as well. Singing sand has been reported on thirty-three beaches in the British Isles including in the North of Wales, on the little island of Eigg in the Scottish Hebrides and at a number of beaches along the Atlantic Coast; at Souris, on the eastern tip of Prince Edward Island, in Manchester-by-the-Sea, Massachusetts, and in other places.